In Arabic and Amharic, with English subtitles. Every so often a film comes along whose very existence can be hard to wrap your head around. Not the ones you can’t believe were ever made – goodness knows there’s no shortage of those – but the ones that simultaneously seem so real and so impossible that watching them is like witnessing a magic trick you can’t figure out. 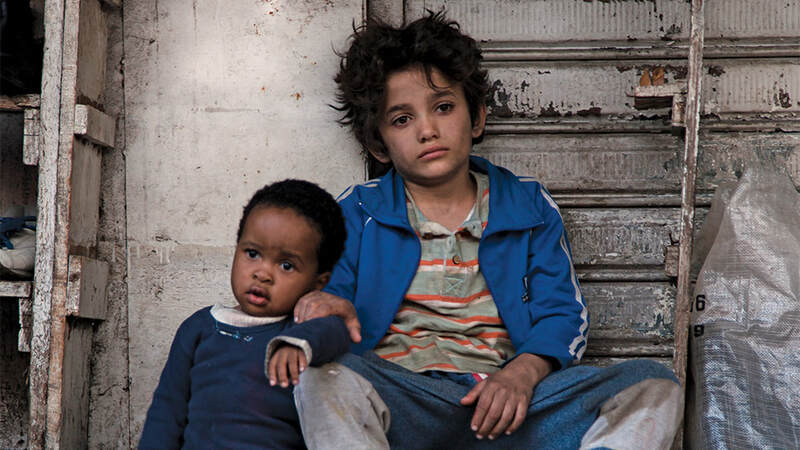 Nadine Labaki’s Capernaum – one of this year’s foreign-language Oscar nominees, and the Jury Prize-winner at Cannes last year – is that kind of film. It’s the story of a child surviving on the streets of Beirut, infused with the richness of great fiction and the heart-in-mouth power of frontline news footage. The peril feels so truthful and specific, and the young cast’s reactions to it so astonishingly natural, that my heart couldn’t work out whether it should break or pop. Bambi-eyed the boy may be, but he’s no Disney innocent; he gets by on his considerable wits. After fetching up at a decrepit theme park, he befriends an Ethiopian single mother called Rahil (Yordanos Shiferaw) and becomes a surrogate big brother to her similarly undocumented toddler Yonas – who’s played by one-year-old Boluwatife Treasure Bankole in what must be, without a sliver of exaggeration, one of the greatest infant performances in cinema history. When Rahil goes missing, Zain becomes Yonas’s guardian too, and the two children must fend for themselves in the direst of circumstances. Zain fashions a makeshift pushchair for Yonas from a skateboard and a cooking pot, and it becomes an image of against-all-odds endurance, the boy doggedly trundling the toddler along through the city’s racket and heat. Capernaum is Labaki’s third and most ambitious film to date: a kind of social-realist blockbuster which in certain nerve-shredding sections resembles nothing less than a world-cinema remake of Baby’s Day Out. The closest thing to it in recent years is Slumdog Millionaire, and the UK poster campaign evokes Danny Boyle’s film with a shot of Zain and his sister Sahar (Cedra Izam) on a dust-blown rooftop. 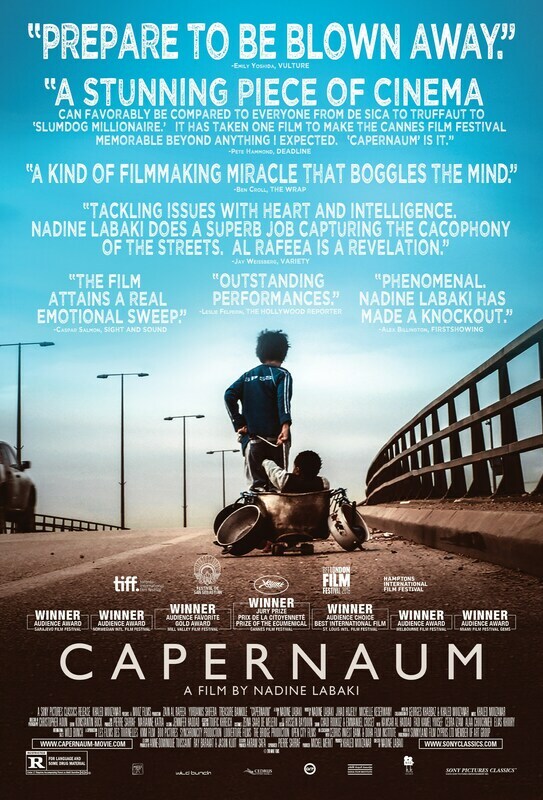 But Capernaum is closer in both texture and spirit to the Brazilian crime epic City of God: it teems with the same excitement and danger as Fernando Meirelles’s film. The sensation of being right there on the ground stems from the nimble camerawork, which darts after Zain through the city’s markets and slums, and also the incidental colour vividly woven through the story itself. Early on, we watch Zain and his siblings grinding Tramadol pills into water and soaking clothes in the solution, before bringing them to his imprisoned older brother on visiting day, so that he can steep out the opioids and sell them to his fellow inmates. This human experience here is wholly recognisable: despairing, darkly funny, sentimental, terrifying, and ethically and politically alive – sometimes all at once. To call it Dickensian would not be too great a compliment. Whether Capernaum has the staying power of the great social-realist films – of Roberto Rossellini and Vittorio De Sica picking through the bones of postwar Italy, of Karel Reisz hovering by the mid-century British kitchen sink, of the Dardenne brothers roaming working-class Belgium – well, that remains to be seen. But in its unbroken gaze and visionary sweep, it already feels like a landmark.